Well, What’s in a Name? About: This short piece recounts some of the stories that were associated with this well at the time of writing in 1907. Originally known as St. Boden’s Well, we find out how it came to be called Father Germaine’s Well, before being dedicated to Our Lady of Mount Carmel around 1902. Publisher / Place of Publication: The Author and/or Leinster Leader Printing Works [?] / Naas, Co. Kildare. About: T. M. O’Reilly from Ballyknockan was a local councillor and writer with a great appreciation of local history. According to Fr. Cantwell of Valleymount, he produced several pamphlets. This booklet mentions old churches and houses of prayer as well as sites of historical or archaeological interest. The derivations of placenames is also featured. The second part of the booklet deals with the various priests who have ministered in the area. Extra #1: Link to the full text of this booklet via this page at blessington.jimdo.com. Extra #2: Hat tip to John Hussey who maintains the Blessington.jimdo.com website for posting the text of this booklet online. Extra #3: Browse the 1901 Census return for the author Thomas O’Reilly. Creator / Author: Blessington-Lakeside Heritage Group & contributors. 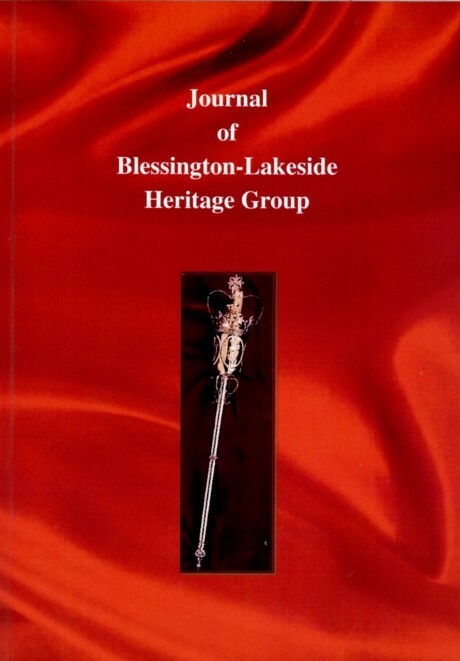 Publisher / Place of Publication: Blessington-Lakeside Heritage Group / Blessington (? ), Co. Wicklow. About: The inaugural publication of a set of articles on aspects of the history and heritage of areas that surround Blessington Lake. All articles are concise ranging from snippets to four and a half pages. Plans are already afoot for the next issue. Extra #1: Contains black & white photographs, illustrations and plans. Extra #2: Blessington-Lakeside Heritage Group can be contacted via email @gmail.com. Use BlessingtonLakeside as the name. Publisher / Place of Publication: Stationery Office / Dublin. 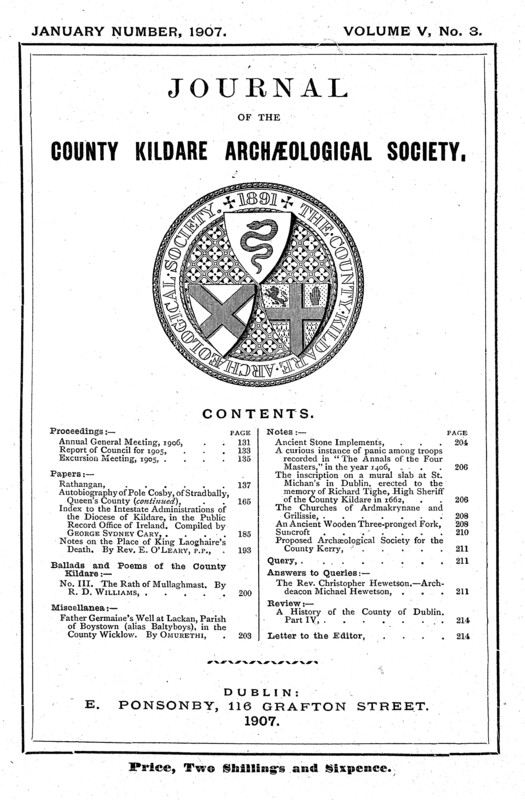 About: This book is part of a series produced by the Archaeological Survey of Ireland, which aims to list all known archaeological monuments in each county. This Wicklow catalogue alone lists 1200 sites. It would be invidious to pick out just some places of major importance. Suffice to say that no matter what part of West Wicklow you come from, there is sure to be at least one item of archaeological interest listed here. Chapters: Introduction – Flint Scatters – Megalithic Tombs – Neolithic Single Burials –Bronze Age Burials — Barrows – Cairns – Ring-cairns – Tumuli — Rock Art – Stone Circles — Standing Stones – Fulachta Fiadh – Miscellaneous Burials – Hillforts – Coastal Promontory Forts – Ringforts – Souterrains – Enclosures – Earthworks – Settlement Sites – Toghers and Roads – Ecclesiastical Sites – Medieval Monastic Sites – Graveyards and Burial Grounds – Children’s Burial Grounds — Ecclesiastical Miscellanea – Bullaun Stones – Ogham Stones – Wayside Cross – Holy Wells – Moated Sites – Rectangular Enclosures – Medieval Earthwork Castles – Anglo-Norman Stone Fortresses – Hall House – Sites of Castles – Tower Houses – Fortified Houses – Historic Towns – Later Houses – Mills and Millstones – Charcoal and Ironworking Sites – Sweathouses – Battlefields – Glossary – Bibliography – Subject and Townland Indexes – Location Maps. Extra #1: Contains many photographs both colour and black & white. Extra #2: Contains 23 pages of locations maps. Extra #5: Link to the Archaeological Survey Database Online and plot these features on current and historical maps. About: This article looks at the documentary evidence for the name of Burgage and for the former name of Donagh-Emlagh (meaning Church of the boggy land). The author also visits the local churchyard and comments on the remains of various buildings and monuments that he observed there. Extra #1: includes photographs and a map. Extra #4: View the entry for ‘Burgage’ in the Placenames Database of Ireland. Extra #5: Browse the 1911 Census entry for the author of this article.